The wonder of the human spirit and how inspirational 'everyday' people can really be was so apparent at the finishing line at Belfast City Marathon on May Day- Monday. (We were there cos my bro-in-law Michael was running.) As the twinny and i watched the faces of the finishers, we found ourselves knocking back tears behind our sunnies. Just cos 'people' are amazing i suppose.... some had the cool stories (you learned a little bit from the voice on the overhead speaker,) like one man knew he wanted to run 'in memory' of the lady who had given him a new liver- that one was worth a tear, but even without knowledge of each runner's "over the loud speaker type of story" we found ourselves just a tad in awe of 'people,' normal people, with their own internal story, probably their own adversity to overcome and reason run for. So then just yesterday, this fresh sense of optimism was shaken after mysteriously losing my purse.. out of nowhere, it was no longer in my bag... & I all I wanted to do was just buy my youngest a smoothie (cos she'd been so sweet & we were on mini- mid week date while the eldest was galavanting.) After about an hour of head-scratching, leaving my mobile number with shop owners, feeling powerless & confused we trundled home smoothie-less and purse-less, resisting the urge to crumble into my frustration and think very bad things about pick-pocketing 'people.' 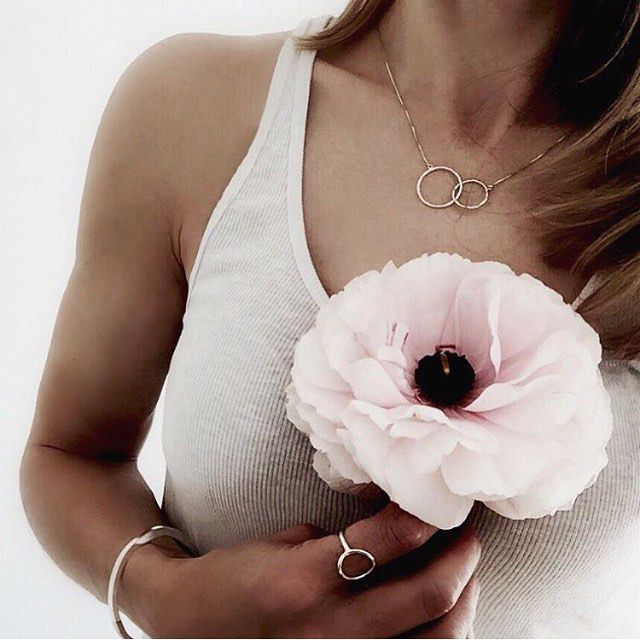 Having made the youngest a very questionable substitute of a smoothie, I read something lovely blogger Sarah Lou had just written and posted on her blog about my minimal jewellery designs. "I've always been drawn to circular shapes & curves...I find them a soothing constant - what goes around comes around. A mindful reminder to hold strength, positivity, peace & love close to my heart & in my being." I looked down at the ODA ring i was wearing and thought, 'at least I didn't loose my Esmee. It's okay.' I shared my thought with Esmee and she confessed that she had, had a dream a few nights before of being 'stolen' and with that, she was quick to be okay with her substitute of a smoothie. Later, as I was processing orders I looked out my window as a stranger was approaching the door. I knew he had it. A taxi driver from Belfast- had found my purse, had poked around inside it for an address to deliver to, (after finding it in the post-office car park in front of a car wash ) and brought it to me. Sure enough I had just cancelled my cards on a nifty bank- phone app & spent the next half hour re-issuing them by phone, but relief that 'people' are yes, indeed inspirational & a reminder to hold positivity close & that kindness will reign over dishonesty, filled my being again. Thank you Belfast taxi-man! Thanks Sarah-Lou for such beautiful photos and for your generous words over on your blog. Here's to functioning instagram friendship at just the right time! So chuffed the minimalism of the jewellery designs can still carry meaning. To read more of her words and see more her her photography of the minimal jewellery, click HERE.